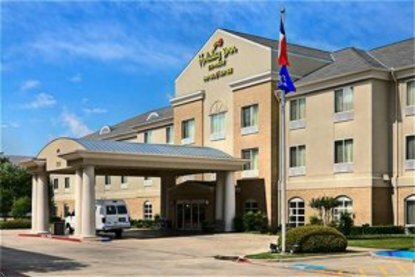 Located just 3 miles from DFW International Airport, the Holiday Inn Express Grapevine is prepared to be the business traveler&regs office away from the office. Our 100% smoke free hotel, complimentary breakfast and free local phone calls make the Holiday Inn Express Grapevine the place to stay for business.Our complimentary wired and wireless High Speed Internet Access, located through out the hotel, allows you to finish last minute presentations and conduct your meeting in confidence. If you left your laptop behind, our business center is ready to serve you 24 hours a day.Whether conducting interviews or hosting a conference for 40 people, Holiday Inn Express Grapevine is ready to accommodate your meeting needs. We can also set up catering options for your luncheon or business dinner.After a long day, relax in our outdoor Jacuzzi, work out in our fitness center or kick back with friends at one of 7 restaurants within walking distance. There&regs no need to rent a car with our complimentary shuttle service, anywhere within five-miles, including DFW International Airport, Gaylord&regs Texan Resort and Grapevine Mills Mall, to name a few. Shuttle service is limited on holidays.Our hotel is one mile from the small town charm of Historic Grapevine and minutes from the nightlife of both Ft. Worth and Dallas. Visit Grapevine and Stay Smart with the Holiday Inn Express Hotel & Suites. FEMA #TX1507 This hotel is committed to providing accessible facilities under the American Disabilities Act. If your accessibility needs are not met, please contact the Hotel Manager on Duty. Should you require additional information regarding accessible facilities for guests with disabilities, please call 1-800-Holiday (U.S. and Canada) or contact the hotel directly. For the hearing impaired, TDD service is available at 1-800-238-5544 within the U.S. and Canada.